It's hard to look beyond the price tag - it's frankly ridiculous. And most competing, top-tier alternatives are better anyway. Some business people need great ultraportable laptops and the price is irrelevant. But even the most care-free buyer will baulk at the Nice Beaches Tax that Dell Australia is dumping on its latest business flagship, In the US this model can be had for US$1449. At the current exchange rate that's $1910 AUD. Yet in the Australian Dell Store the same laptop is on sale for a whopping $4605.70. What do you get for that extra $2696? Well it's not a holiday to the US and it's not two 11-inch MacBook Airs. We'd love to say Dell Australia throws in the fingerprint reader and SmartCard reader but these are optional extras too. Touted as the world's smallest business-class laptop with a 13-inch display, the Dell Latitude 13 7000 series is an evolution of the popular consumer-centric Dell XPS 13 family, with enhancements designed for business people. The machine is slim compared to the average bulky business laptop, and it sports Dell's InfinityEdge display and weighs just 1.12KG. Our Latitude 7370 review unit came with 128GB of storage and 8GB of RAM, with a 1.1GHz Intel Core M processor (m5-6Y57) under the hood. Our 7370 has a full-HD resolution (1920 x 1080), non-touch display and an aluminium lid. The Latitude 7370 has a large number of configuration options that businesses can tailor to their precise requirements. For example, the 13.3-inch display is available with two different resolutions: The non-touch, full-HD version we reviewed, and a higher-end QHD+ (3200 x 1800) touch screen. A premium carbon fibre lid option is also available, but it costs even more. The Latitude 7370's solid-state drive (SSD) is available with storage capacities of 128GB, 256GB and 512GB, and RAM options of 4GB, 8GB and 16GB. All models also have microSD card slots. The build quality of the laptop feels very robust, and you can hold it by one corner of the screen when it is fully open, and it barely flexes. Two rubber feet line the bottom of the chassis and run parallel down its length, and they reduce potential slippage. The bottom chassis of the laptop is made of the same soft-touch black plastic as Dell's XPS series, and it similarly accumulates fingerprints very quickly, which is unfortunate. And like the XPS series, Dell placed the Latitude 7370's webcam at the bottom left corner of its display. The awkward camera angle captures distorted images, so it's not ideal for frequent video calling. The machine comes with some factory-loaded apps, but they are mostly unobtrusive. A couple of them, such as Dell Power Manager and Dell Touchpad, are actually quite useful. Despite its low-voltage microprocessor and the Windows 10 Pro OS, the Latitude 7370 is relatively responsive. We tested it with Microsoft Office installed, Outlook set up with both Exchange and Gmail (IMAP), Google Chrome as a browser, OneDrive for cloud storage and Skype for other communications. With this configuration, it never felt like 7370's CPU struggled to keep up. However, we didn't try heavier stuff, such as Photoshop or video encoding, and full-on gaming is probably out of the question, unless you plan to play lightweight games, such as Tetris or the bundled Candy Crush. The keyboard is a good size, and it feels closer to that of a desktop keyboard than other ultraportables. It's still not full-size, which is somewhat disappointing, because many of the most popular high-end ultrabooks, including the 12-inch MacBook, have full-sized keyboards. You cannot click the 7370's multi-touch trackpad, and it may take some getting used. However, the two buttons at the bottom work well once you get the hang of them. Dragging two fingers vertically scrolls the page up and down, and a pinch gesture zooms in or out. 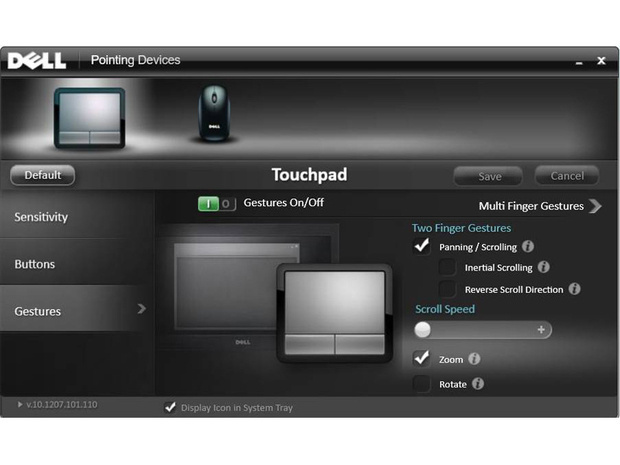 The Dell Touchpad app lets you change settings, including sensitivity and custom multi-finger gestures. Does the Latitude 7370 offer a "full day" computing away on a single charge? That depends. Battery life varies widely depending on the tasks you perform, which could be attributed to the Intel Core M processor. Continued use involving heavier tasks, such web browsing with multiple opens tabs, and video streaming, for example, quickly decrease the life of a fully charged battery to six hours or less. Less-intensive tasks, such as replying to email and writing in Word, drain power much slower, and the 7370 got as much as nine hours of life. Power users and travelers will appreciate the Latitude 7370's ability to control the device's charge rate through its Dell Power Manager app. The "ExpressCharge" setting powers up a dead 7370 to about 80 percent in an hour when turned off, or up to 100 percent in approximately two hours. We tested this claim and found that with ExpressCharge enabled, the battery reached 59 percent after the first hour and 93 percent at the end of the second hour. Though our experience doesn't match Dell's claim, it's still impressive because you can fully recharge in slightly more than two hours. Businesspeople who work mostly at a desk can choose the "Primarily AC Use" setting to lower the charge threshold. 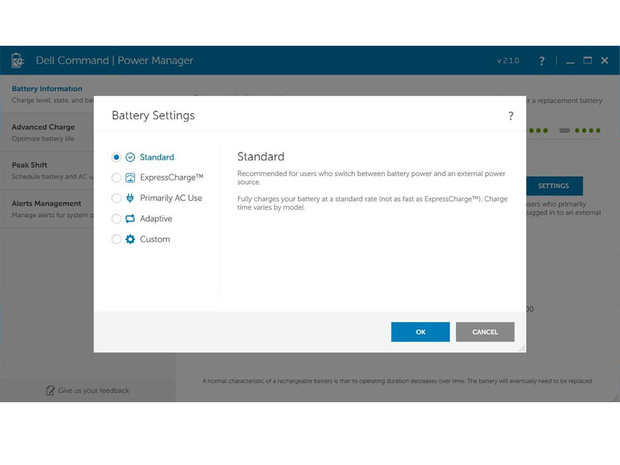 The setting charges the laptop more slowly, which is designed to extend the battery's life. You can create a "Custom" setting to specify when you want to start and stop powering up. And the "Adaptive" option automatically sets charge time based on your usage. One of the Latitude 7370's key strengths is its variety of business-centric features, such as a built-in fingerprint scanner and smartcard reader (both optional extras). The touch fingerprint reader works better than other similar scanners on rival laptops, but it's not as reliable as those found on newer smartphones, which is disappointing. The Latitude 7370 has two Thunderbolt USB-C ports, a micro HDMI port, and a USB-A 3.0 port. One of the two Thunderbolt ports can be plugged into a portable battery to power up the 7370. (Dell offers a USB Type-C external battery that it says provides up to an addition 20 hours of battery life for the Latitude 7370.) The machine's USB 3.0 port is handy for hooking up existing USB hardware without having to purchase adapters, and the Thunderbolt 3 ports promise up to 40Gbps data transfers. The Latitude 7370 also comes with optional WWAN and WiGig wireless, and the latter option lets it to dock wirelessly with a WiGig station to expand available ports and for faster data transfer than is available via 802.11ac Wi-Fi. The Latitude 7370 is an attractive and well-designed laptop that is well suited for business users with modest computing requirements. It offers security features that are not available in many consumer laptops, such as a fingerprint and smartcard reader, as well as the latest wired and wireless connectivity options. The PC has its shortcomings, but overall it's a solid option for travelers who seek a functional, portable, and most importantly business-centric laptop. However, there are other options including the HP Elite X2 convertible which is more powerful, better specified and much cheaper and the Surface Pro 4 (ditto). If you want something more similar to this Latitude, Lenovo's Carbon is about $2000 cheaper! Otherwise, you may as well have a holiday to the US and buy it than pay this ridiculous price. That all said, Dell's corporate range are generally 'sold' on a lease basis. Just be sure the IT negotiator in charge of that pricing is well aware of the sticker price disparity. If you're a consumer and want something of a similar size from Dell, check out the XPS line.